Well, we made it so far, and while the rest of the world has been bruised and battered with one "rolling bear market" after another, as Labor Day in the US comes to a close, the S&P500 is at all time highs, having risen 8% this year, and is now trading above 2,900 after the quietest August in 50 years. So what happens next? As Bloomberg's David Wilson writes, if past is prologue the market will bring nothing but post-holiday cheer for the next 4 months. Here is a stunning statistic: since 2009 when central banks became stock market activists and unleashed the longest bull market in history, the S&P 500 has moved higher every year between Labor Day and year-end. The gains have averaged 7.2% annually, and have ranged between 1.4% in 2012 and 13.9% in 2010. 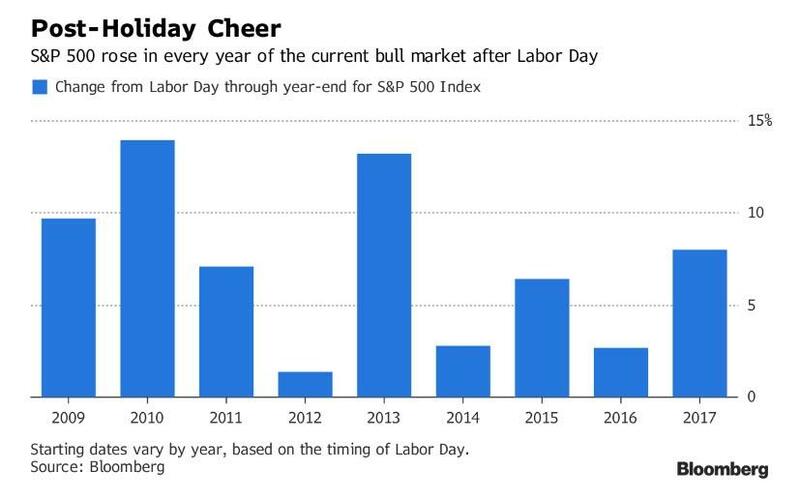 The trend was originally mentioned in a post by Schaeffer's Investment Research analyst Rocky White, who writes that the S&P 500 has been positive the last nine years in a row from Labor Day through the end of the year. The table below shows that over the past 20 years, there were nine occasions when the index was up at least 5% heading into Labor Day. 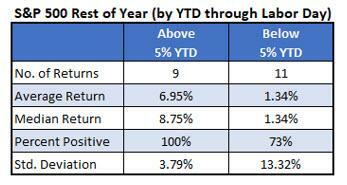 In those nine years, the rest of the year was positive every time, with an average gain of 6.95%. The other years were positive just 73% of the time, with an average return of only 1.34% -- and way more volatility, going by the standard deviation of returns. So more of the same "new normal" pattern, or will 2018 be the first year in the past decade when stock fail to post gains in the last 4 months of the year? Indicatively, the last time stocks went lower post Labor Day... was the end of 2008, when it fell about 30% in the last three months of the year during the financial crisis.